An edited version of this review was published in The Straits Times on 2 May 2012 with the title "Winds soar with Spanish roots". 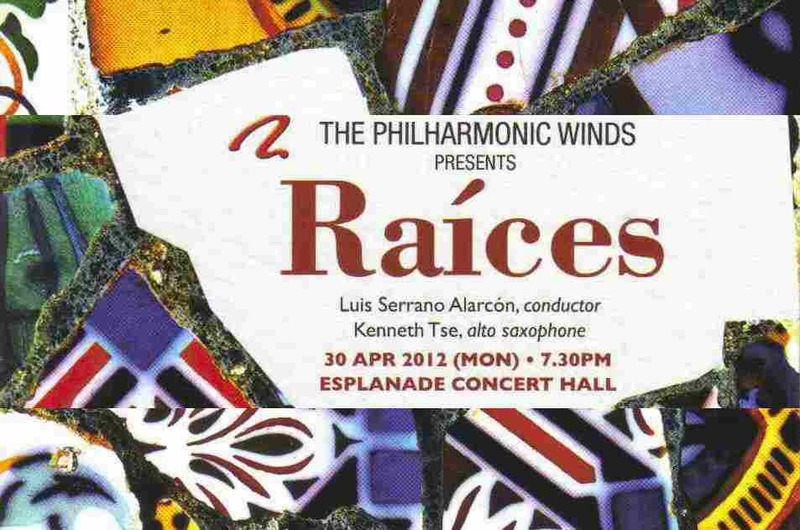 Raíces is the Spanish word for roots or origins, the premise being that Ibero-American songs, dance rhythms and their forebears provided the link to all the works in this exciting programme conducted by the Spanish composer-conductor Luis Serrano Alarcon. It was thus no coincidence to hear a second performance of Argentine Alberto Ginastera’s Estancia Suite within ten days. Like the earlier reading by the Singapore Symphony Orchestra conducted by a Venezuelan, The Philharmonic Winds’ version was a rowdy affair driven by percussive beats. The major difference was with the absence of strings, the reedy and brassy sound in Alarcon’s orchestration provided a more hard-edged and raucous feel to the four dances. Despite some idiomatic solo flute playing, only a sense of intimacy was found wanting in the tender Danza del Trigo (Wheat Dance). In Alarcon’s own Duende (a term connoting inspiration), four preludes also based on dances saw the art form elevated to one where individual prowess was highlighted alongside ensemble playing. With electric guitar, bass and piano supporting the orchestra, the lines between folk, jazz and popular music became blurred. A rambunctious Tempo de Buleria, reminiscent of Copland and Bernstein, closed with the infectiously rhythmic clapping of hands. 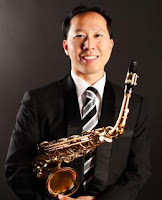 The evening’s highlight was Alarcon’s Concertango, a three movement virtuoso concerto featuring American Chinese saxophonist Kenneth Tse (left) as soloist. Emerging from the wings after the music had begun, Tse’s full-bodied sound was a joy to behold. His control, from the softest of tonal caresses to the most penetrating of fortissimos, not to mention his ability to tango and swing with utmost liberty, was awe-inspiring. The winds supported him admirably, oozing nostalgia in the slow milonga and then letting rip with precision in the frenetic fugal finale. With multiple contrapuntal lines flying, it was a marvel how the whole Molto Allegro was so tightly held together. This same commitment was applied to the Mexican Arturo Marquez’s popular showpiece Danzon No.2, a gradual crescendo that was ratcheted to the full-blown dazzler of a close. With spirits aloft, two further encores, Astor Piazzolla’s sassy Libertango and Costa Rican Victor Hugo Berrocal’s carnival-like Mambo de la Big Big Big, brought down the house. Whoever said one cannot have too much of a good thing?